I found this baby in a newspaper ad in a pretty sorry state with numerous missing and damaged parts. The project started out as a restoration to put it back to the original factory appearance but when it came time to do the cosmetics and motor, I reconsidered. 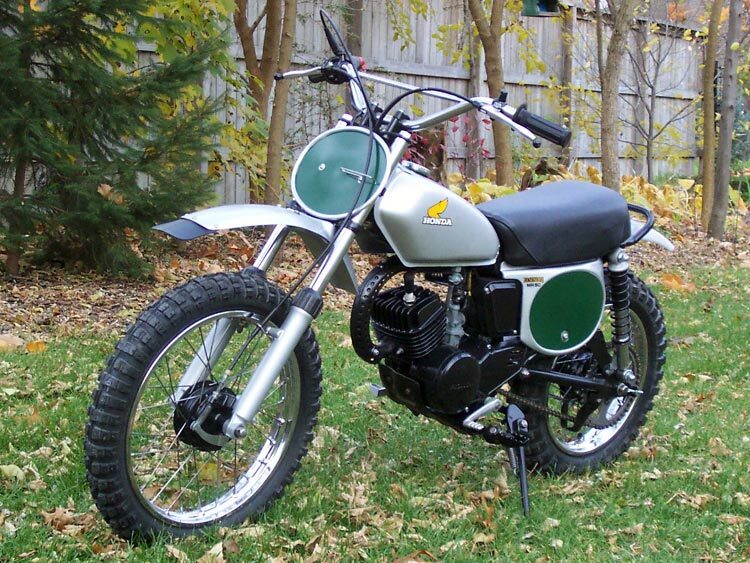 My favourite Elsinores of the past were the 1974 CR models that were silver and green. I had already restored a silver and red 1975 MR50 several years back so this project became an attempt to make a mini 1974 CR Replica. Everything was bead blasted, primed, painted, relaced and or rebuilt. To match the big brother CRs, the motor and wheel hubs were painted black and all cosmetics were painted silver. Some parts were modified or hand made to create the CR illusion. Detailing was a little obsessive at times. For example, the rear brake rod was painted in three separate sections to create the illusion of the CR brake cable and hardware. The seat cover and side panel graphics were also custom made. The green and black stripes on the tank, new tires and SHOWA stickers on the rear shocks finished it off. Note the mud flap, shifter, Elsinore graphics, black motor and black wheel hubs. The project took one year to complete and has been featured on Racer X Magazine web site under the "My Collection" column as well as the RE-MX web site that provides MR 50 parts. I plan on taking a spare set of fork legs and customizing them to be offset at the axle like the CR125 forks were in the 70's. I guess it will finally be done at that point. Thanks for looking.